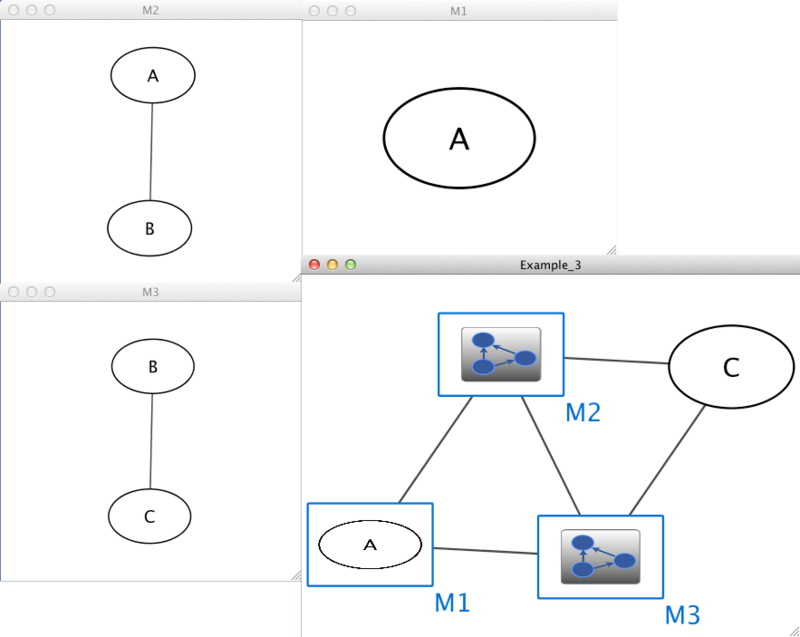 XGMML (extensible graph markup and modelling language). The SIF format specifies nodes and interactions only, while other formats store additional information about network layout and allow network data exchange with a variety of other network programs and data sources. Typically, SIF files are used to import interactions when building a network for the first time, since they are easy to create in a text editor or spreadsheet. Once the interactions have been loaded and network layout has been performed, the network may be saved to GML or XGMML format for interaction with other systems. All file types listed (except Excel) are text files and you can edit and view them in a regular text editor. The simple interaction format is convenient for building a graph from a list of interactions. It also makes it easy to combine different interaction sets into a larger network, or add new interactions to an existing data set. 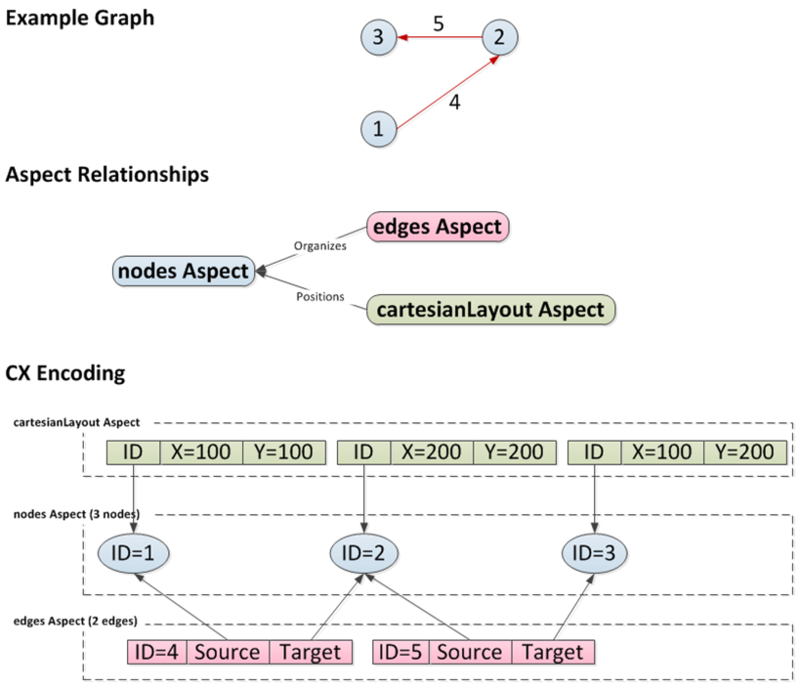 The main disadvantage is that this format does not include any layout information, forcing Cytoscape to re-compute a new layout of the network each time it is loaded. 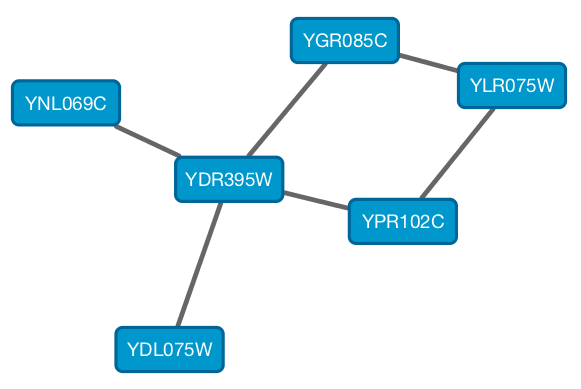 The first line identifies two nodes, called node1 and node2, and a single relationship between node1 and node2 of type typeA. The second line specifies three new nodes, node3, node4, and node5; here “node2” refers to the same node as in the first line. The second line also specifies three relationships, all of type typeB and with node2 as the source, with node3, node4, and node5 as the targets. This second form is simply shorthand for specifying multiple relationships of the same type with the same source node. The third line indicates how to specify a node that has no relationships with other nodes. This form is not needed for nodes that do have relationships, since the specification of the relationship implicitly identifies the nodes as well. Every node and edge in Cytoscape has a name column. For a network defined in SIF format, node names should be unique, as identically named nodes will be treated as identical nodes. The name of each node will be the name in this file by default (unless another string is mapped to display on the node using styles). This is discussed in the section on Styles. The name of each edge will be formed from the name of the source and target nodes plus the interaction type: for example, sourceName (edgeType) targetName. The tag “edgeType” can be any string. Whole words or concatenated words may be used to define types of relationships, e.g. geneFusion, cogInference, pullsDown, activates, degrades, inactivates, inhibits, phosphorylates, upRegulates, etc. Whitespace (space or tab) is used to delimit the names in the simple interaction file format. However, in some cases spaces are desired in a node name or edge type. The standard is that, if the file contains any tab characters, then tabs are used to delimit the fields and spaces are considered part of the name. If the file contains no tabs, then any spaces are delimiters that separate names (and names cannot contain spaces). If your network unexpectedly contains no edges and node names that look like edge names, it probably means your file contains a stray tab that’s fooling the parser. On the other hand, if your network has nodes whose names are half of a full name, then you probably meant to use tabs to separate node names with spaces. Networks in simple interactions format are often stored in files with a .sif extension, and Cytoscape recognizes this extension when browsing a directory for files of this type. If a network name (first entry on a line) appeared previously as a node name (in columns 2 or 4), the network will be nested in the node with the same name. Also, if a name that has been previously defined as a network (by being listed in the first column), later appears as a node name (in columns 2 or 4), the previously defined network will be nested in the node with the same name. In summary: any time a name is used as both, a network name , and a node name, this implies that the network will be nested in the node of the same name. Additionally comments may be included on all lines. Comments start with a hash mark ‘#’ and continue to the end of a line. Trailing comments (after data lines) and entirely blank lines anywhere are also permissible. Please note that if you load multiple NNF files in Cytoscape they will be treated like a single, long concatenated NNF file! If you need to embed spaces, tabs or backslashes in a name, you must escape it by preceding it with a backslash, so that, e.g. an embedded backslash becomes two backslashes, an embedded space a backslash followed by a space etc. It is generally not necessary to modify the content of a GML file directly. Once a network is built in SIF format and then laid out, the layout is preserved by saving to and loading from GML. Properties specified in a GML file will result in a new style named Filename.style when that GML file is loaded. XGMML is now preferred to GML because it offers the flexibility associated with all XML document types. If you’re unsure about which to use, choose XGMML. There is a java system property “cytoscape.xgmml.repair.bare.ampersands” that can be set to “true” if you have experience trouble reading older files. This should only be used when an XGMML file or session cannot be read due improperly encoded ampersands, as it slows down the reading process, but this is still preferable to attempting to fix such files using manual editing. Cytoscape has native support for Microsoft Excel files (.xls, .xlsx) and delimited text files. The tables in these files can have network data and edge columns. Users can specify columns containg source nodes, target nodes, interaction types, and edge columns during file import. 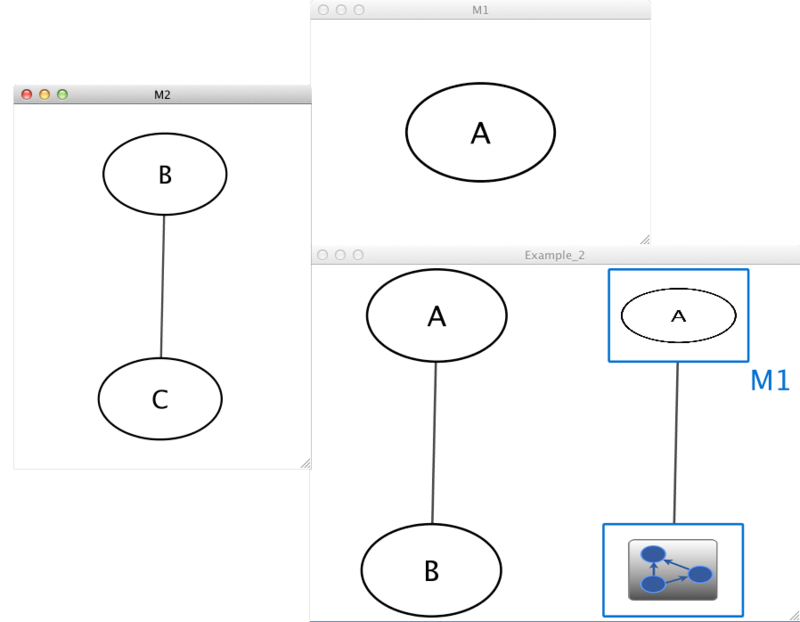 Some of the other network analysis tools, such as igraph (http://cneurocvs.rmki.kfki.hu/igraph/), has feature to export graph as simple text files. Cytoscape can read these text files and build networks from them. For more detail, please read the Import Free-Format Tables section of the Creating Networks section. "name" : "YGR085C (pp) YLR075W"
"name" : "YGR085C (pp) YDR395W"
"name" : "YDR395W (pp) YDL075W"
"name" : "YDR395W (pp) YPR102C"
"name" : "YDR395W (pp) YNL069C"
"name" : "YLR075W (pp) YPR102C"
Export network and table to Cytoscape.js feature in Cytoscape creates a JSON file WITHOUT style. This means that you need to export the style in a separate JSON file if you apply style to your network. Please read the Style section for more details. CX is a JSON-based transfer format that enables diverse Cytoscape Cyberinfrastructure (CI) services to exchange networks while preserving all network-related information. It is designed for flexibility, modularity, and extensibility, and as a message payload in common CI REST protocols. It enables applications to standardize on core aspects of networks, coordinate on more specific or unique standards, and to ignore or omit irrelevant aspects. It is not intended as an optimized format for storage or for specific functionality in applications. CX is an Aspect-Oriented Network Interchange Format, where the base information is a list of nodes. Independent data structures (called aspects) organize and elaborate on nodes and each other. The core of CX defines five aspects, though a more comprehensive CX document describes many more aspects. The “nodes” aspect contains only the identifiers of the network’s nodes, The “edges” aspect contains identifiers for each edge along with the identifiers of the nodes the edge connects. The “networkAttributes” aspect contains name-value pairs describing the network. The “nodeAttributes” and “edgeAttributes” aspects contain name-value pairs attached to specifically identified nodes and edges. Critically, applications are free to add and maintain their own aspects without coordinating or negotiating with disinterested applications. As an illustration using the picture below, a three node network can be described as a list of nodes (“nodes Aspect”) and edges that link them (“edges Aspect”). If the network has been laid out, a separate aspect (“cartesianLayout Aspect”) can describe the position of each node. More concretely, a CX encoding would have three nodes in the “nodes Aspect”, each with unique IDs. 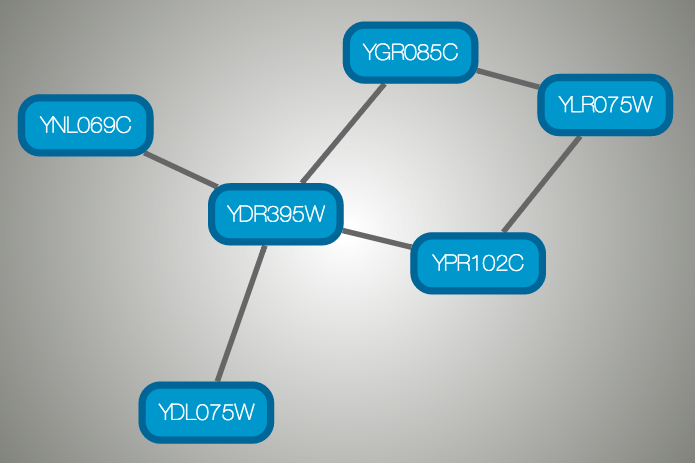 The “edges Aspect” references each node by ID, with each edge having its own ID. 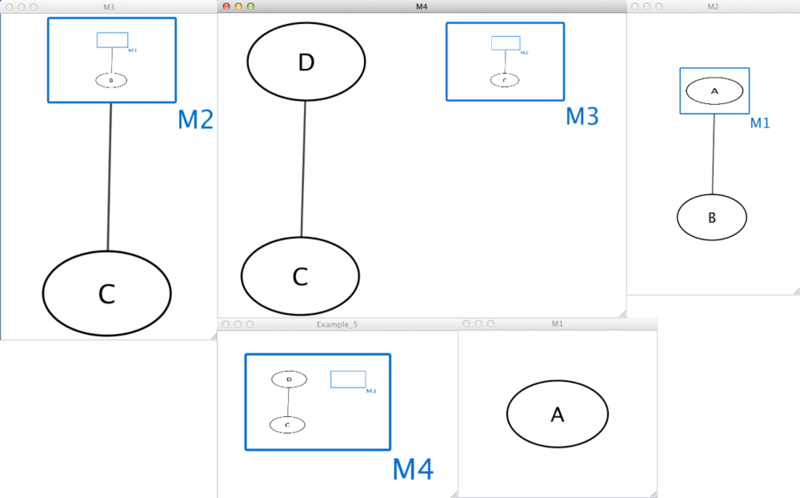 Finally, the “cartesianLayout Aspect” ties coordinates to nodes by ID. In fact, a network may have many aspects, describing node and edge attributes, subnetworks, visual properties, groups and so on.